I’m not sure whether the CSS-selectors are the same for all templates but you can figure them out easily by running some Page Inspector/Web Development Tools in your browser (just right-click an object and search for a similar function). You can even do this from RStudio’s preview pane btw! b.) looks for a <!--more--> line in your post’s content. 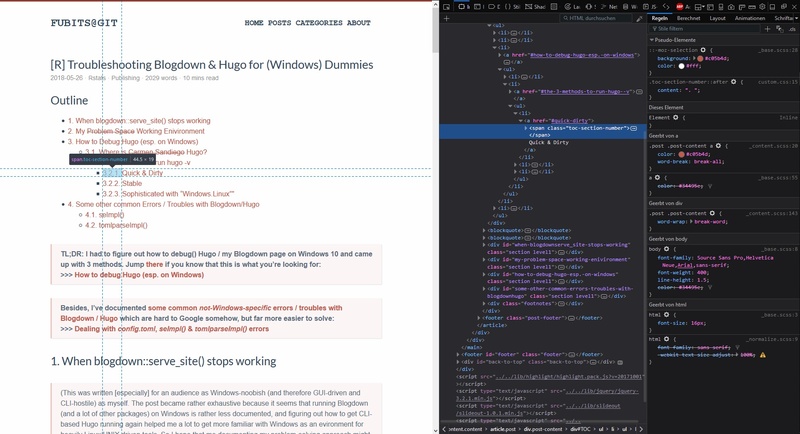 Hugo then simply parses all the content until it reaches<!--more-->. In order to fix this / automate your own summary, IMHO the easiest workaround seems to be to change the variable .Summary to .Description in your theme’s summary.html template (you’ll find it here: <PageSource>\themes\<your-theme>\layouts\post\summary.html) and use description = 'text' in your post’s YAML header instead. description: "This post is about something something."